Choosing what type of doors to install in your home can be tricky business. Lucky for you, Greg’s Glass have the experience and knowledge to help take some of the stress out of the decision. We’ve been installing and repairing sliding doors, vantage windows, and security doors in Rockingham for some time now. Today, we’re going to take a look at the difference between French and Patio doors, to help you decide which is right for your home. First up, what exactly is the difference between these two types of door? French doors are hinged double doors that usually open outwards but sometimes they can also open inwards. When French doors are open, they provide full access to the width of the opening they’re installed in. Patio doors open by sliding. You can generally get a much wider opening space with a patio door. The only issue is that you can only usually open about half of the space at any one time – as the door needs to slide somewhere! 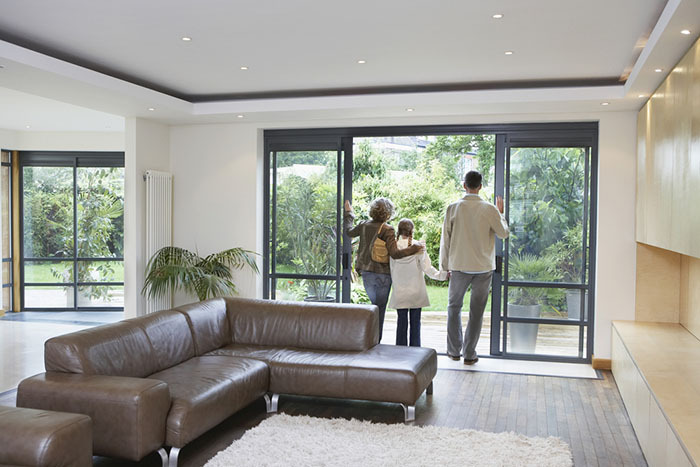 Patio doors are suitable for restricted spaces as they won’t protrude from the wall when open. This is a common question among our customers when they compare these two products and there is no set answer. The cost can vary, and it really depends on the opening size that you have. As a rule of thumb, Patio doors tend to be a little bit cheaper than French doors. But French doors can get expensive, especially as the size they need to cover gets larger. Both types of doors come with security features. Here are some things that you should look for in your purchase. Patio doors should have a multipoint lock, with security hooks that prevent the doors from being levered open. Drop bolts are also a good addition. You can also invest in anti-lift devices and other upgrades. Patio doors benefit from toughened double-glazing, too. French doors should have multi-point locks and three to five point locks are best. They should also have cover splines, which serve to protect the gap where the two doors meet, as this is the weakest point on a pair of French door. This is an important factor, as doors help to insulate your home and help you to save money on your energy bills. As both Patio and French doors are often made of glass, they can sometimes lack in insulation. However one way to get around this is by investing in double glazed glass. When you’re shopping around, you’ll also want to consider the size of the opening and your budget. Are you thinking about investing in some new French, Patio or sliding glass doors in Perth? Talk to Greg’s Glass today. We can install windows for you as soon as you need them. Please don’t hesitate to get in touch with us.